All rugs are handwoven by the traditional tribes of Anatolia, Turkey. Each and every rug has an attached story with it. Handwoven with high-quality pure wool. Excellent condition. Material: 100% Wool. Vintage Handmade Turkish Anatolian Wool Muted Kitchen Runner Rug 114"x34"
Material : Wool on cotton. Age (year) : 40. FREE SHIPPING Vintage Handmade Turkish Oushak Kitchen Runner Rug 118"x31"
This is a very beautiful rug which will light up your whole room. Caucasian rugs are made in one of two of major rug producing areas in central Asia (the other is Turkoman) and are both recognize for the high quality weaves of their respective nomadic tribes. This is a very beautiful rug which will light up your whole room. Material: Wool. The rug is in Good condition. The rug has been ready for use or display. Vintage Handmade Turkish Anatolian Wool Kitchen Runner Rug 112"x43"
Vintage Handmade Turkish Oushak Runner Rug 9'9"x2'6"
Keeping a rug clean is most easily and best done on a regular basis. Firmly brushing a wool or cotton rug with a stiff broom or using. First step in cleaning a spill should be to soak up as much liquid as possible by pressing a clean cloth over the spill, both from front and back of the rug. Vintage Handmade Oushak Turkish Runner Rug 115"x39"
FREE SHIPPING 11x4 Vintage Handmade Turkish Muted Oushak Rug Runner 11'x4'6"
11'x4'6" feet. Condition : Good condition, Ready for using, Professionaly cleaned, No stain, hole or worn. Material : Wool on cotton. Origin : Middle of Anatolia. 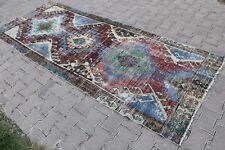 Vintage Handmade Turkish Oushak Blue Red Runner Rug 240x88cm, 94"x34"
Size of this runner rug is 240x88cm, 94"x34" and weight of this handmade rug is about 7 kg. Woof and weave of this runner rug is pure sheep wool. While this handmade rug was woven, handspun yarn dyed by naturel and vegetal colours had been used. This is a very beautiful rug which will light up your whole room. The rug has been ready for use or display. My Prices already very reasonable,affordable and wholesale prices to the public. The rug has excellent colors. Vintage Handmade Turkish Oushak Runner Rug 9'10"x3'2"
Keeping a rug clean is most easily and best done on a regular basis. Firmly brushing a wool or cotton rug with a stiff broom or using. 9'10"x3'2" feet. First step in cleaning a spill should be to soak up as much liquid as possible by pressing a clean cloth over the spill, both from front and back of the rug. Vintage Handmade Turkish Oushak Runner Rug 103"x27"
Material : Wool on cotton. Age (year) : 30. 12x4 Vintage Handmade Turkish Oushak Runner Rug 12'10"x4'10"
12'10"x4'10" feet. Condition : Good condition, Ready for using, Professionaly cleaned, No stain, hole or worn. Material : Wool on cotton. Origin : Middle of Anatolia. Vintage Handmade Turkish Oushak Runner Rug 11'1"x3'10"
Keeping a rug clean is most easily and best done on a regular basis. Firmly brushing a wool or cotton rug with a stiff broom or using. 11'1"x3'10" feet. First step in cleaning a spill should be to soak up as much liquid as possible by pressing a clean cloth over the spill, both from front and back of the rug. FREE SHIPPING Vintage Handmade Turkish Oushak Rug Runner 9'6"x3'3"
9'6"x3'3" feet. Condition : Good condition, Ready for using, Professionaly cleaned, No stain, hole or worn. Material : Wool on cotton. Origin : Middle of Anatolia. Vintage Handmade Turkish Oushak Runner Rug 12'x1'9"
12'x1'9" feet. Condition : Good condition, Ready for using, Professionaly cleaned, No stain, hole or worn. Material : Wool on cotton. Origin : Middle of Anatolia. Keeping a rug clean is most easily and best done on a regular basis. Firmly brushing a wool or cotton rug with a stiff broom or using. 13'3"x3' feet. First step in cleaning a spill should be to soak up as much liquid as possible by pressing a clean cloth over the spill, both from front and back of the rug. New ListingVintage Handmade Turkish Kitchen Oushak Runner Rug 11'2"x3'3"
Keeping a rug clean is most easily and best done on a regular basis. Firmly brushing a wool or cotton rug with a stiff broom or using. 11'2"x3'3" feet. First step in cleaning a spill should be to soak up as much liquid as possible by pressing a clean cloth over the spill, both from front and back of the rug. 18x3 Extra Long Vintage Handmade Turkish Oushak Red Runner Rug 18'2"x3'5"
Design: Caucasian. Dye: Naturally. Material: 100% Wool. Colour: Blcak, Red. Vintage Handmade Turkish Oushak Runner Rug Carpet 10'6"x2'4"
12x5 Vintage Handmade Turkish Oushak Runner Rug 149"x62"
8'4"x2' feet. Condition : Good condition, Ready for using, Professionaly cleaned, No stain, hole or worn. Material : Wool on cotton. Origin : Middle of Anatolia. 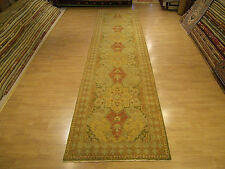 FREE SHIPPING 13x3 Vintage Handmade Turkish Oushak Rug Runner 13'4"x3'10"
13'4"x3'10" feet. Condition : Good condition, Ready for using, Professionaly cleaned, No stain, hole or worn. Material : Wool on cotton. Vintage Handmade Turkish Oushak Runner Rug 280x125cm,111"x49"
Size of this area rug is 280x125cm,111"x49" and weight of this handmade rug is about 6 kg. While this handmade rug was woven, handspun yarn dyed by vegetal and vivid colours had been used. Appearance of this spectacular handmade rug is elegant and quite bright. FREE SHIPPING Vintage Handmade Turkish Oushak Runner Rug 119"x31"
Vintage Handmade Turkish Anatolian Red Pink Runner Rug 124"x37"
Vintage Handmade Turkish Anatolian Multicolor Office Oushak Rug Runner 144"x30"
Age (year) : 40. Size (cm) : 367x77. New ListingVintage Handwoven Turkish Kitchen Distressed Oushak Runner Rug 8'9"x3'2"
All rugs are handwoven by the traditional tribes of Anatolia, Turkey. Each and every rug has a attached story with it. Wholesale available! Vintage Handmade Turkish Anatolian Overdyed Oushak Runner Rug Carpet 84"x36"
Material : Wool on wool. Age (year) : 40. Vintage Handmade Turkish Oushak Runner Rug 11'x3'1"
Keeping a rug clean is most easily and best done on a regular basis. Firmly brushing a wool or cotton rug with a stiff broom or using. 11'x3'1" feet. First step in cleaning a spill should be to soak up as much liquid as possible by pressing a clean cloth over the spill, both from front and back of the rug. New ListingLong Vintage Handwoven Turkish Oushak Runner Rug 12'5"x2'1"
Vintage Handmade Turkish Oushak Herki Runner Rug 355x68cm,140"x27"
Woof of this Turkish runner rug is genuine Anatolian cotton and weave of the rug is 100 % pure sheep wool. When this handmade rug was produced, the handspun yarn dyed by naturel and vivid colours had been used. Vintage Handmade Turkish Muted Kitchen Oushak Runner Rug 8'8"x2'7"
New ListingLong Vintage Handwoven Turkish Kitchen Distressed Oushak Runner Rug 14'4"x3'11"
Keeping a rug clean is most easily and best done on a regular basis. Firmly brushing a wool or cotton rug with a stiff broom or using. 14'4"x3'11" feet. First step in cleaning a spill should be to soak up as much liquid as possible by pressing a clean cloth over the spill, both from front and back of the rug. New ListingVintage Handmade Turkish Kitchen Oushak Runner Rug 8'10"x3'10"
Keeping a rug clean is most easily and best done on a regular basis. Firmly brushing a wool or cotton rug with a stiff broom or using. 8'10"x3'10" feet. First step in cleaning a spill should be to soak up as much liquid as possible by pressing a clean cloth over the spill, both from front and back of the rug. New Listing14x3 Long Vintage Handwoven Turkish Oushak Runner Rug 14'2"x3'6"
Keeping a rug clean is most easily and best done on a regular basis. Firmly brushing a wool or cotton rug with a stiff broom or using. 14'2"x3'6" feet. First step in cleaning a spill should be to soak up as much liquid as possible by pressing a clean cloth over the spill, both from front and back of the rug. New ListingVintage Handwoven Turkish Oushak Runner Rug 11'2"x3'11"
Keeping a rug clean is most easily and best done on a regular basis. Firmly brushing a wool or cotton rug with a stiff broom or using. 11'2"x3'11" feet. First step in cleaning a spill should be to soak up as much liquid as possible by pressing a clean cloth over the spill, both from front and back of the rug. This is a very beautiful rug which will light up your whole room. The rug has been ready for use or display. The rug is in Good condition. The rug has excellent colors. Caucasian rugs are made in one of two of major rug producing areas in central Asia (the other is Turkoman) and are both recognize for the high quality weaves of their respective nomadic tribes. Material: Wool. Vintage Overdyed Handmade Turkish Oushak Runner Rug 10'2"x1'8"
FREE SHIPPING Vintage Handmade Turkish Office Oushak Runner Rug 8'1"x3'3"
This is a very beautiful rug which will light up your whole room. The rug has been ready for use or display. The rug has excellent colors. My Prices already very reasonable,affordable and wholesale prices to the public. HAND WOVEN TRIBAL MEHRABAN RUNNER ORIENTAL CARPET RUG 13'8"X3'8"